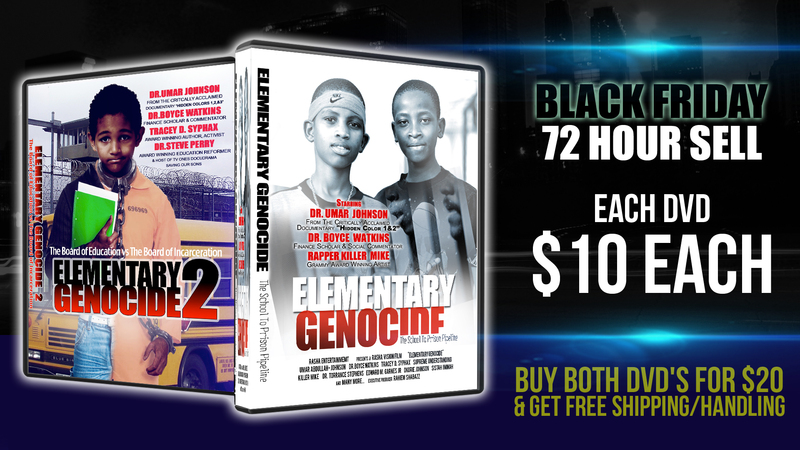 Elementary Genocide: “The School To Prison Pipeline” exposes the socially engineered mechanism created by our government and utilizing the public school system to label elementary aged African American males as work for hire targets within the US penal system. Many refuse to believe there is a corporate attack on the minds and productivity of Black youth through intercepting their educational, economical and social development, and resulting in statistically funneling them through the revolving doors of the criminal justice system. Elementary Genocide confirms this theory and seeks to educate parents, teachers and families, so that we can reclaim our young men and ensure the future of our community. Rahiem Shabazz continues the conscience-raising dialogue generated by his acclaimed documentary Elementary Genocide: The School To Prison Pipeline with his equally hard-hitting Elementary Genocide 2: The Board of Education vs The Board of Incarceration. Featuring interviews with noted educator and Black psychologist Dr. Umar Johnson, Chief Juvenile Court Judge Steven C. Teske, fearless former U.S. Congresswoman Cynthia McKinney, former political prisoner and Black Liberation Army co-founder Dhoruba bin Wahad, popular social commentator Dr. Boyce Watkins, award-winning education reformer Dr. Steve Perry, White House champion of Change Winner & Author Tracey D. Syphax and more, The Board of Education vs The Board of Incarceration uncovers the true purpose of today’s educational system and how it’s failing the African child. Going beyond the school-to-prison pipeline headlines and conspiracy theories, The Board of Education Vs. The Board of Incarceration proves that something sinister is afloat by digging deep to explore its origin, its existence and how to plot its destruction to save every Black child.